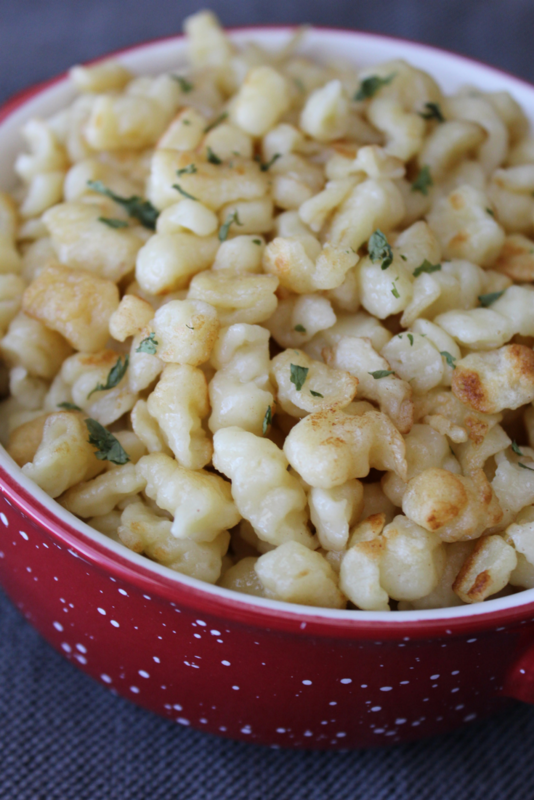 Unless you have a super German family member, it is likely you have never heard of spaetzle. And let me tell ya! You’ve been missing out. 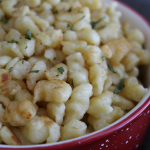 Spaetzle is a small dumpling that hails from Europe, most commonly, certain regions of Germany. A simple egg noodle dough is made and then pressed through a spaetzle machine (or a colander) into a pot of gently boiling water. It’s great to serve as a side dish in place of mashed potatoes or as the egg noodle in your favorite soups. My dad’s side of the family has a strong German heritage, and I remember times spent at Grandma’s house when preparing dinner, she would bring out this metal bowl with holes in the bottom and an auger that snapped into place. 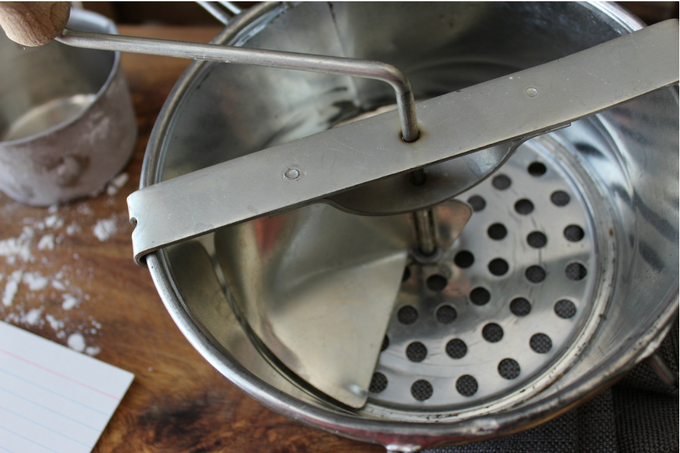 Grams would place the noodle dough in the spaetzle maker and turn the auger to press the sticky dough through the holes at the bottom into a pot of water. When the spaetzle was cooked she would drain them and add melted butter. Some of my best memories I ever made in the kitchen right there. 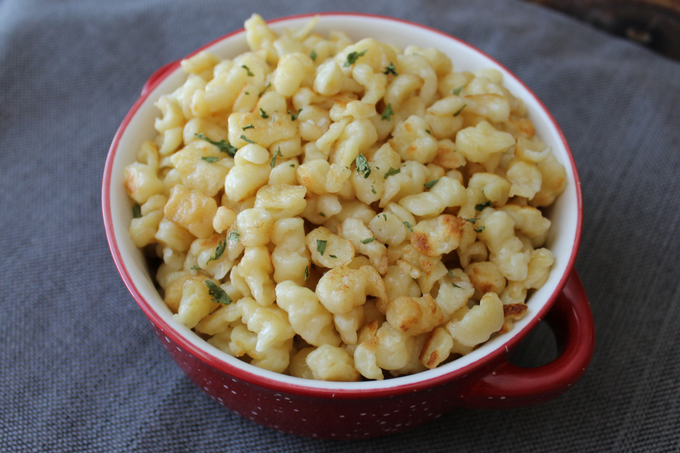 When Grandma passed away a few year ago, the one thing I knew I wanted of hers was that spaetzle maker and index card that had her hand-written recipe for spaetzle. The card is crinkled with smudged ink and the spaetzle maker slightly rusted on the handle, but I wouldn’t change it for anything. 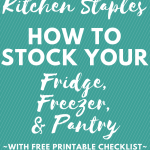 This recipe is sure to claim a spot in my Top 10 comfort foods of all time. Make a well in the center of the flour, add the eggs and milk. Gently fold the flour into the wet mixture. The dough will be very sticky, but that is ok. In a large pan over medium high heat bring salted water to a gentle boil. Place the noodle dough in the bowl of your spaetzle maker and push the dough out into the boiling water. If you don’t have a spaetzle maker, put dough in a colander and push through the holes with a spoon or bench scraper. Once all the noodles are pressed out, gently stir the noodles occasionally for 2-3 minutes until the spaetzle floats to the top of the pot. Drain and serve.